Running Arizona, Like a Lunatic. As is usual with weddings, there is sometimes the need for recovery oriented activities on the day after. Such was the case in Arizona this past weekend when after a very late bed-time of 12AM (midnight is late for a 35 y/o middle aged man such as myself), I set my alarm for 5.30, and settled into bed for a few hours of sleep. 5.30 came around, my alarm went off, my wife elbowed me in the face when I didn't hear it, and then I proceeded to groan for 20 minutes before throwing a leaky gallon water-jug in my too big REI day pack along with 3 cake-pops from the wedding and some trail mix from PCC. At this early point in my run, life felt like a run-on sentence. 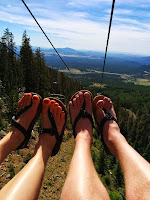 Pictured above are Kristi and I's premium Luna Adventure Sandals, my footwear of choice for this adventure run. Running with a f*#@ing backpack: a discovery in chi running.